This article is dedicated to Artists. Here is a list of WordPress themes for artists that they can use to create their website. These themes are designed to let them showcase their skills in the best way possible. The themes are specially designed to let your create portfolios, galleries and posts to let you showcase your work. They come with special section for the introduction and displaying the services provided by you. However, all you need to do with this theme is to update it with proper data and make some optional customization. Rest will be managed itself. You won’t have to spend time managing the features and functionality of the theme. We have created this list so that you won’t have to spend time visiting different websites and choosing the theme. These are the best options at one stop. You can choose the theme that works for your subject, visit the sales page and own it. 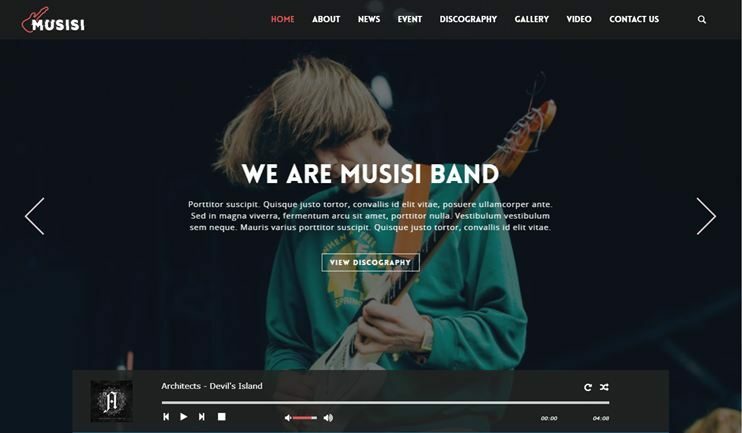 Musisi WordPress theme is for musicians, bands or music artists. The theme even lets you show beautiful events on the website. It has pre designed spaces to show images/video galleries as well as discography. This theme is easy to customize and manage, even for the beginners. You can use the live customizer to preview the changes as you make them.The theme is SEO optimized.Musisi comes with custom post types based on its purpose. So, if you are an artist or a group of artist, this theme is one of the best to create your online presence. 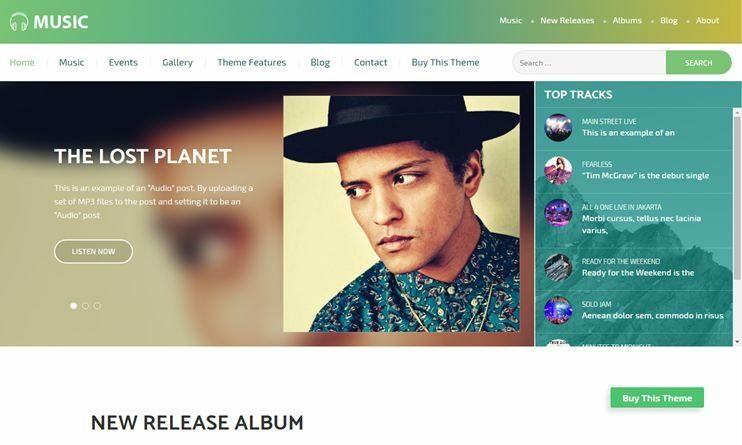 This theme has everything which will be a perfect match for your music site in 2018. The high quality of functionality and elegant design will keep the visitors or subscribers at your website. 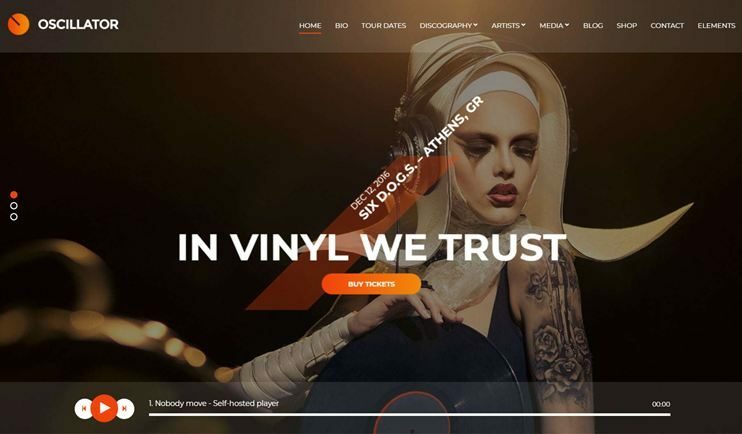 It’s features and functions are specially crafted to let you create a musicians and singers website, Dj Producer websites, Rock/Pop music band websites and much more!This stylish,responsive, powerful and mobile friendly theme is ideal for music and audio websites. 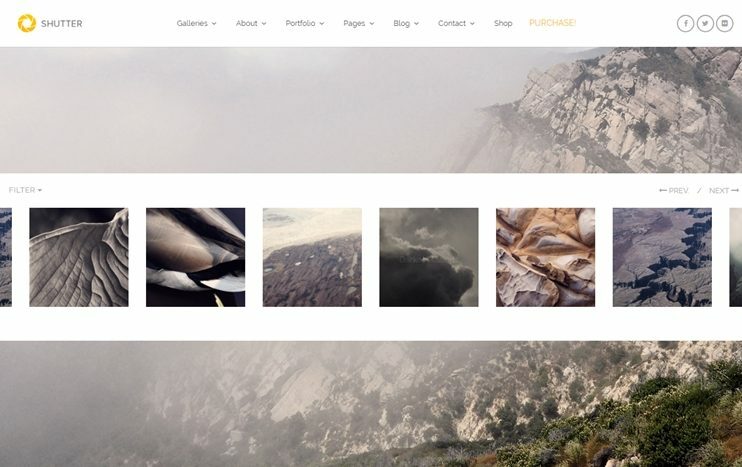 Shutter is a WordPress theme dedicated to photography artists. This theme has design and features to display your images elegantly. It has a minimal design and you can opt for the dark or light skin. Shutter is designed to let you display your photographs and image albums systematically so the visitors do not get confused. You can also create amazing portfolios. There are gallery templates you can choose from. The theme is widget ready and so it is easy to manage the content of your webpages. So, if you are a photographer who wants to create and manage his own website, you can opt for this easy to use theme. Oscillator is a music based theme. You can use this theme to create a website for artists, musicians and singer. The theme comes with an inbuilt streaming audio player. The homepage of this theme is totally manageable. Because the content can be organized by dragging and dropping the widgets at the right place. It comes with features to manage discography and events. The theme comes with admin options to manage your website easily. You can easily create and manage galleries. It is SEO ready too. There are a lot of purpose oriented custom widgets and custom post type. Inked, as the name suggests, is a theme dedicated to tattoo artists. This theme allows you to create a website that will provide an online presence to your business. You can use this theme to create a website for piercing studios, tattoo or body art or any kind of creative studios. 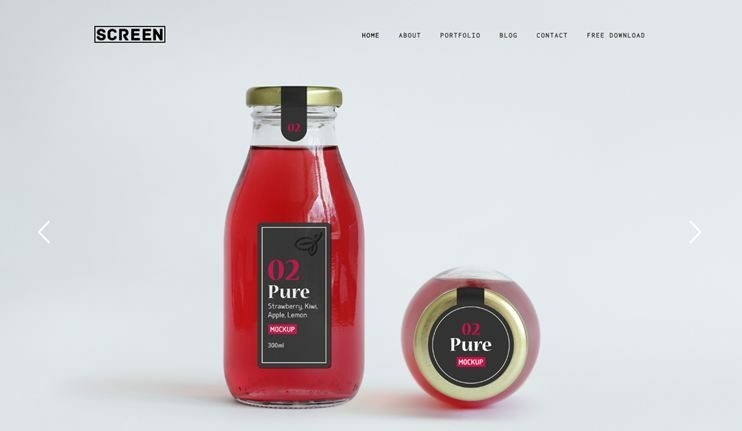 This theme has a clean and stylish design with parallax scrolling sections. You can manage the design of the pages with the drag and drop page designer. It comes with a ready to use booking modal and image modal. It is very easy to customize. The options available at the admin panel are provided by the Redux framework. Atjeh is a WordPress theme for artists, photographer or creative agencies. It has all the features using which you can showcase your work. It allows you to create pages with the drag and drop page builder. You can use the live customizer to change how the website looks. The admin options lets you manage the website easily. To change the typography of your website you can use the Google fonts. Atjeh is SEO optimized. 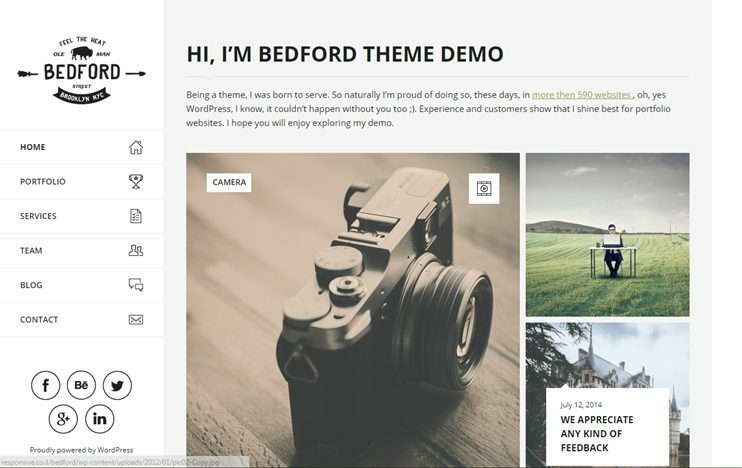 Bedford is a responsive theme that enables you to create creative websites in 2018. You can use this theme to create websites for freelancers or artists. It can also be used to display photography skills of a photographer.There’s an inbuilt page builder that you can use to create pages of your website. The theme supports retina ready graphics. The theme layout is based on flexible grid system where you can elegantly display your content. It comes with simple options to manage your website. There are customization features to let you change and personalize the look of your website. 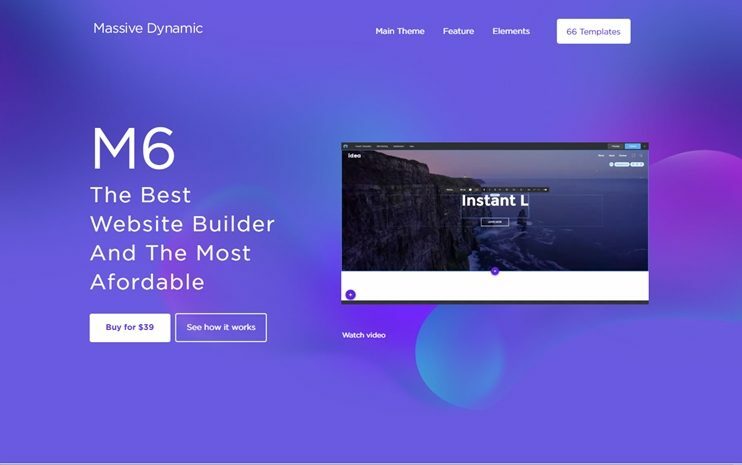 Massive dynamic is a feature rich and flexible theme for creating websites in 2018. With this theme, you can create websites for creative agencies and design studios. There’s no limit of what you can create with it. The theme comes with more than 50 demo designs to choose from. Each of this demo is designed as a complete purpose oriented website. You can use the drag and drop page builder to create stunning pages. It allows WooCommerce integration for ecommerce facilities. It is speed and performance optimized. You can create portfolios too. This theme comes with shortcodes and intuitive options to manage your website. The Agency is a responsive WordPress theme designed for creative agencies. 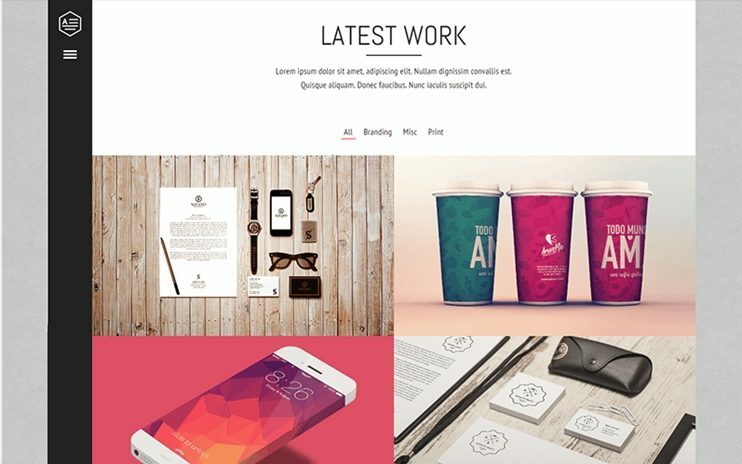 You can use this theme to showcase your work, skills or projects and publish news. It is easy to use and manage. It is speed optimized. So, the enhanced performance is sure to improve the user experience. The theme options available for managing the theme are easy and intuitive. This theme comes with custom post types and widgets areas to help you organize the content. You can use the included child theme template to create advanced customizations. Alpha is also one of the portfolio WordPress themes for artists. 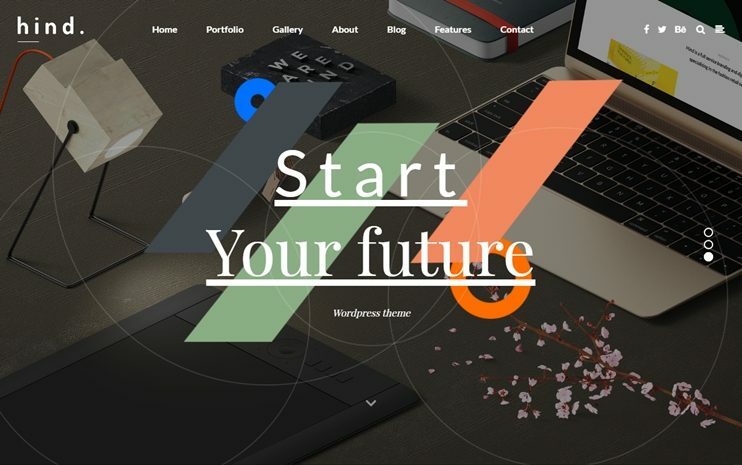 With this theme you can create amazing portfolios. 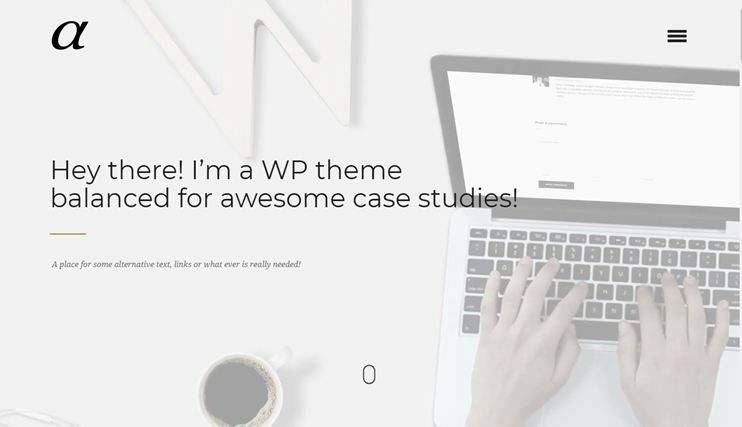 This theme is designed to let you showcase your work. Alpha comes with amazing designs and smooth animations. This theme is designed to provide a smooth user experience. It comes with a drag and drop page composer to let you create page designs of your choice. Alpha is speed and performance optimized. It is SEO ready too. Tower is a multipurpose business theme. If you want to create a business oriented website, you should have a look at what it has to offer. The theme comes with multiple demo options to choose from. This theme is extremely feature rich and flexible. It is security driven theme and is very easy to customize. You can create pages with the drag and drop visual composer page builder. The theme also lets you use WooCommerce for ecommerce features. There are various slider programs included. Tower can also be used to create amazing one page websites. The theme is SEO friendly. There are more than 30 portfolio options to let you create amazing portfolios. Hind is feature rich and multipurpose WordPress theme. The theme is basically designed for portfolios and creative websites. With hind you can create distinguished online portfolios. The theme comes with about 14 demo variants to choose from. There are amazing sliders and portfolio layouts. You can set unlimited colors and use google fonts to change the typography. The pages and page content can be managed by the Visual Composer drag and drop page composer. Hind is compatible with the WooCommerce for providing ecommerce features. It is SEO optimized too. 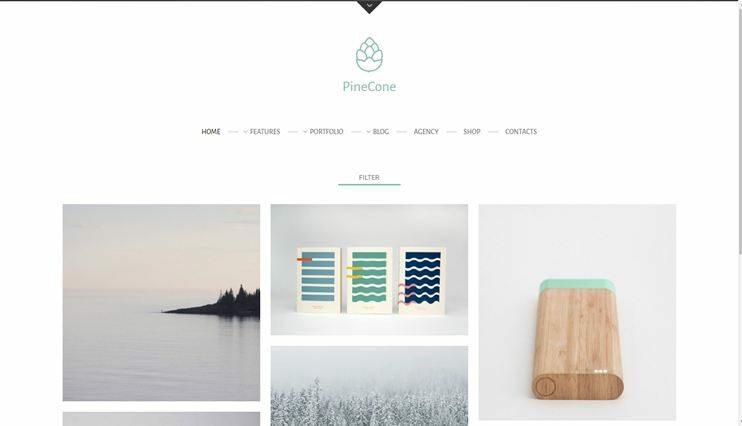 Pinecone is one of the creative WordPress themes for artists. 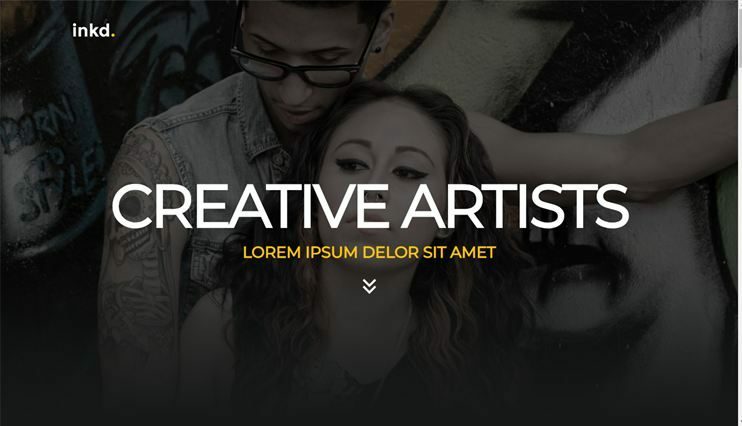 You can use this theme to create online portfolios and creative agency. It is simple but has great design and comes with all the basic features to manage your website online. Pinecone has a modern and minimalist design. 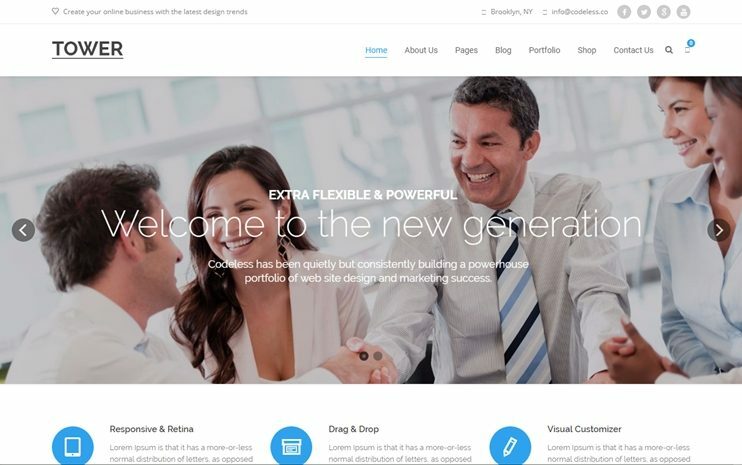 With this theme you can create amazing portfolios in minutes. The portfolios can be created with easy options. The theme also offers enough customization options to personalize your website. The theme options are provided by the option tree framework. It is SEO friendly. Screen is a beautiful theme with even more beautiful and responsive full-screen slider. with the customization options and theme options, you can make it look and behave the way you want. 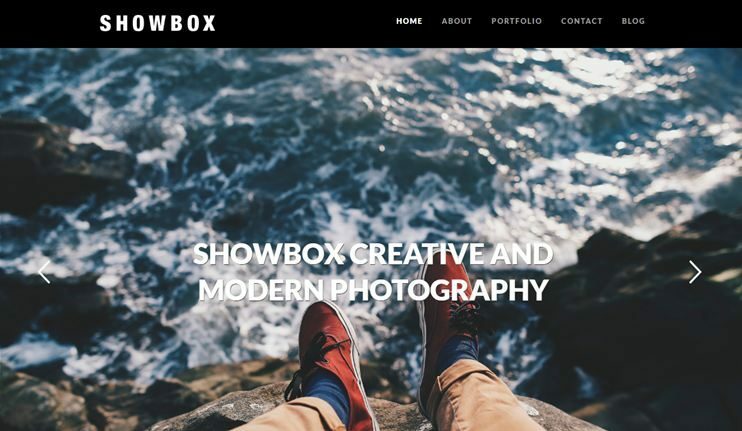 Showbox is for the artists who want to display their creations using a wordpress website. It has a sleek design and focuses on the images. Moreover, the theme is responsive and SEO friendly. The elegant sliders are responsive to impress your mobile users. This theme is completely responsive and comes with unlimited theme options to manage how your website works. We just wanted to help the artists to find a theme that can fit their needs. We hope this list really saves your time so that you can focus on what you love the most, your creativity! These themes are intentionally designed for artists like you. They are easy to use and creative. Moreover, the flexibility of each of the themes lets you apply your own ideas and make your website more attractive and user-friendly. So, just grab a theme, and get yourself and online identity in for of your profession website, now.